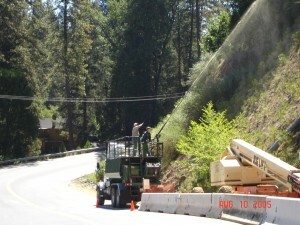 Work was completed to stabilize a roadside slope located 5 miles south of Westpoint, CA on State Highway 26. The slope sheds directly into the Mokelumne River via a drain inlet approximately 25 yards from the toe of the slope. CalTrans was faced with the challenge of stabilizing an eroding 0.5:1 slope potentially adding sedimentation to the Mokelumne River below and putting a home site in danger above. 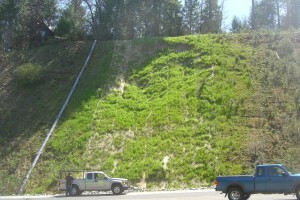 CalTrans needed a quick, effective method to permanently stabilize the slope. 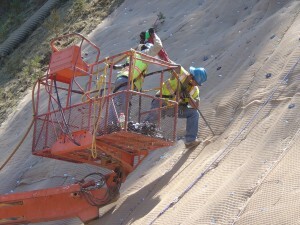 CalTrans had previously placed synthetic netting on the slope with intention of adding surface tensile strength at a low material installation cost. Unfortunately, this method did not maintain the slope and within one year of installation the slope failed. CalTrans, already under enormous pressure to comply with the NPDES regulations, has recently been under additional pressure to set the standard in the state in terms of storm water pollution prevention. Under those pressures District 10 maintenance managers placed the site under an emergency status with a maximum budget of $99,999 allowing CalTrans to hand select only the best installation contractors in the state. The site represented an area of approximately 5000 square feet and an average slope angle of 0.5:1. The width of the slope was 50 feet and the height was 100 feet. Access to the top of the slope was restricted by access rights. 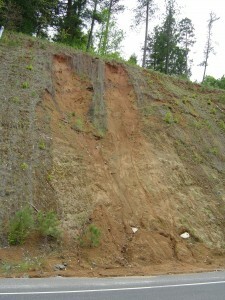 A two lane paved road at the toe of the slope allowed unobstructed access from the bottom. Early on it was determined that extensive preparation work would be needed before the turf reinforcement mat could be placed. The initial failure of the slope had left large reels and indentations. In order for the turf reinforcement mat to work most effectively it is necessary that the earthen surface area be smooth and without any major indentations. The most effective method to remove the reels and indentations was to shave the slope with flat shovels and chip away the negative portions with a chipping hammer at the top. This was accomplished by rappelling down from the top of the slope. When finished the hillside prep ended up with approximately 12 cubic yards of loose soil and rock. K-Rails where placed at the toe of the slope to keep all spoils off of the paved road during this phase. Next a 2’x2’x50’ anchor trench was dug 6 feet back from the crest of the slope. The turf reinforcement rolls were then pinned into the anchor trench using 18″ galvanized pins. Guide lines where then installed to identify the perimeter of the project. Pine seedlings in the project area where flagged to be pulled through the mat during installation. Hydroseeding then took place using a native seed mix with tackifier. The seed mix was left overnight to allow for drying. 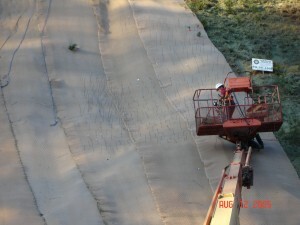 After the seed mix had dried the turf reinforcement mat was deployed over the side of the slope. The mats then where aligned for accurate coverage and correct seam overlapping. The seams where then diaper pinned together. After the diaper pinning additional 18″ straight pins were laid out on a grid of 2.5 pins per square yard. The pins were then driven into the slope using a bulldog rock hammer. Approximately 5800 pins were used. The purpose of the pins was to create intimate contact between the turf reinforcement mat and the slope. Additional anchoring took place using 650 mechanical anchoring devices driven into the slope. These mechanical devices are driven into the slope using a 40lb jackhammer. A steel tendon on each anchoring device is then pulled to engage the mechanical device. Once the device is engage the tendon is pulled through the turf reinforcement mat and a UV protected 4” plastic washer is slipped onto the tendon. After the washer is placed a one way washer is placed over the washer to lock the washer in place. Following the installation of the mechanical devices final cleanup took place resulting in a total export of 15 cubic yards. CalTrans expressed complete satisfaction with the project and plans to use this method of slope stabilization in many other similar situations. Vegetation was fully established by spring of 2006 resulting in a completely stabilized slope.